At Bluewater Plumbing, Heating, and Air Conditioning our mission is clear. We are dedicated to providing you with this highest level of customer service by providing you with practical solutions and efficient dependable repair. We do more than just repair your home or business' most vital systems. We insure that they will operate at peak performance for many years to come. This gives you peace of mind and helps you save time and money in the long run. 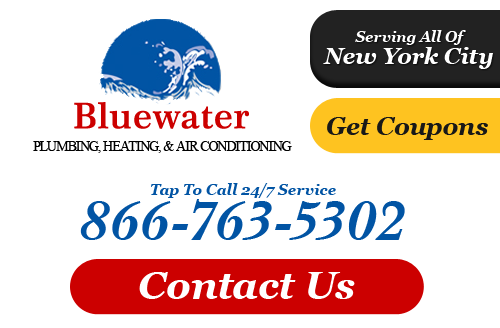 So when you need a Queens plumber, heating contractor, or air conditioning company you can rely on, remember to give Bluewater Plumbing, Heating, and Air Conditioning a call. You'll be glad you did. What Can You Expect From Bluewater? Dependability - We stand behind our work and always give you results that exceed your expectations. You can feel confident that every job will be done right the first time. Quality - We combine advanced technology with skilled, experienced plumbers and HVAC technicians in order to insure that every project is performed to industry standards. Efficiency - We arrive promptly to every job, get right to work, and the job done in a manner that is efficient, so that you can get on with your day. Affordability - Our rates are competitive, and we never overcharge you for any service or product. We give you accurate estimates that you can count on upon completion. Professionalism - Each member of our team is dressed professionally and practices safe methods. We are insured, certified and licensed. When we enter your home or business we conduct ourselves in a friendly and courteous manner. Experience and training are central to our company. Our plumbers in Queens, NY have several years of combined industry experience and can perform a wide variety of tasks with both residential and commercial plumbing. From plumbing repairs to complete kitchen and bathroom remodeling work, you can rely on our team of professionals for the finest plumbing services in Queens and the surrounding areas of New York. We also specialize in backflow prevention, drain cleaning, forzen pipe thawing, and can help you with eco friendly, green plumbing solutions for your home or business. At Bluewater Plumbing, Heating, and Air Conditioning we never stop learning. As new technology changes and develops we provide ongoing training and enrichment for all our staff. We stay current with certifications, licensing, and city and state codes for all work to be done. This ensure you get the quality heating services you deserve from true industry professionals. Call us today for any type of residential or commercial heating repairs, installations, inspections or maintenance services you may need. Our Queens heating services team is always ready to provide our clients with quality heating solutions. We offer a wide array of AC services that are designed to keep your air conditioning unit running at peak performance throughout every season of the year. Some of our services include complete installation, air conditioning repairs, ongoing maintenance, and even ductless and high velocity air conditioning solutions. When you need to keep cool, our Queens air conditioning company is here to provide you with the services and products you need! Here at Bluewater Plumbing, Heating, and Air Conditioning, our dedication to find the best products and tradesmen helps us in our quest to provide construction and repair service that is second to none. With our endless list of suppliers and our constant attention to reducing costs and overhead, our clientele are guaranteed the best value. Our Queens plumbers have the experience and training to complete your plumbing project with the professionalism and craftsmanship it deserves. Residential or commercial, our team of professionals can take care of it all. So the next time you need plumbing, heating or air conditioning services in Queens or any of the surrounding areas of New York, please give us a call. We'll gladly take on your service request! If you are looking for a Queens plumber or heating and air conditioning company, then please call 866-763-5302 or complete our online request form.